At first glance, you might take the silver pendant on this necklace as an artistic design of lines and curves, that is, until a closer inspection reveals that it is actually displaying an artistic monogram of up to three letters. This Sterling Silver Monogram Necklace is made for special order, allowing you to have a truly authentic piece of jewelry that you can treasure forever. This necklace features a truly unique, sterling silver pendant composed of three letters joined together to create one beautiful, bold design. The size of the pendant is approximately 37mm by 30mm and is attached on either corner by a chain that easily balances the weight of the monogram. The pendant comes in high-polish sterling silver, which makes the letters stand out all the more. This sterling silver necklace is classy and unique at the same time, offering a fun way to play with your name. Be part of the design by selecting the letters you want featured in this monogram silver pendant. The necklace will be made to your specifications, and serve as a wonderful showpiece to wear with any outfit and to pair with other silver jewelry. Monogram measures 37mm (1 +") x 30mm (1 3/16") and comes with an 18" or 20" chain. 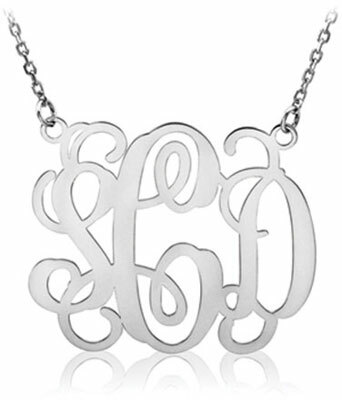 We guarantee our Sterling Silver Monogram Necklace to be high quality, authentic jewelry, as described above.